Giant Mushroom 2 - Dino Rentos Studios, INC. This is an amazing poison mushroom (Amanita muscaria)! 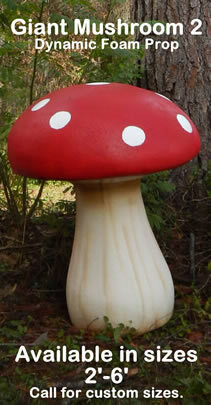 Perfect for any Alice in Wonderland themed event/production or environmental setting! 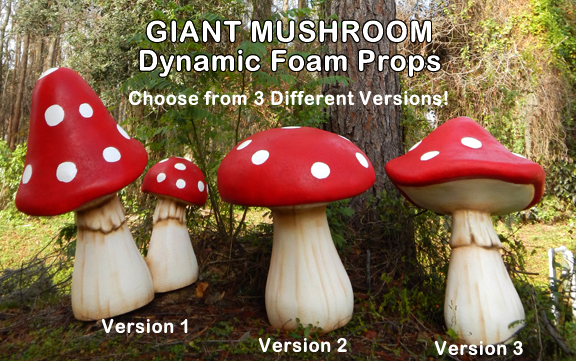 Create your own playland with these oversized, lifelike foam props! Add plastic coating for durability. For indoor use. Call for custom sizes and mushrooms for outdoor use. SHIPPING NOTICE: SHIPPING COST WILL NOT SHOW ON INVOICE. WE WILL CONTACT YOU FOR SHIPPING CHARGES OF FREIGHT. Feel free to call us for ordering assistance!